In 1888, Pierre Bonnard moved to Paris to study at the Academie Julien and the Ecole des Beaux-Arts along with Denis and Vuillard. 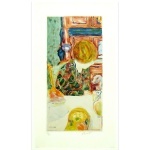 Influenced by the colors of Gauguin, Bonnard founded the group Les Nabis (the prophets in Hebrew.) Amidst the formation of abstraction, Bonnard kept to landscapes and interiors which came from from his interest in Japanese prints. Moved by the passionate colours in the work of Van Gogh, Bonnard founded the Salon d’Automne in 1903.